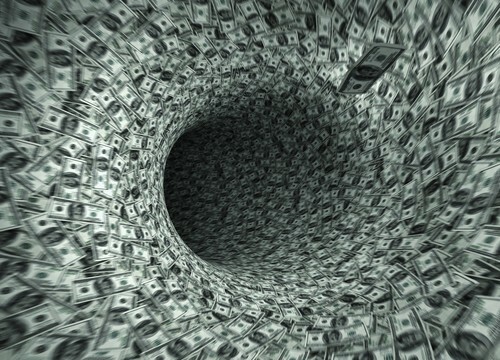 The biggest problem confronting the global monetary elite is sovereign debt. There’s too much of it, it’s growing fast and it cannot possibly be paid off in real terms. A default larger than any in history with trillions of dollars in losses for investors is coming sooner rather than later. The only question is what form the default will take. Once the form of the default is ascertained, it’s easy to estimate the winners and losers and the approximate timing. The first myth that needs to be busted is the idea that the world “learned its lesson” in the 2008 crisis and the system has been made safer since then. It’s not true. In fact, debt has been piled on debt since 2008. All that happened since the 2008 crisis is that government debt has been used to substitute for some private debt, while private debt has continued to grow on its own. These charts are for loans and securities only. They do not include interbank lending or derivatives. The total amount of derivatives, which is just off-balance sheet debt, both over the counter and exchange traded, exceeds $1 quadrillion (that’s a thousand trillion)! There’s nothing inherently wrong with debt subject to two conditions: The debt is used for productive purposes and your capacity to repay the debt is growing faster than the debt itself. In other words, are you borrowing for good reasons, and can you afford to pay it back? Unfortunately, governments have failed both conditions. 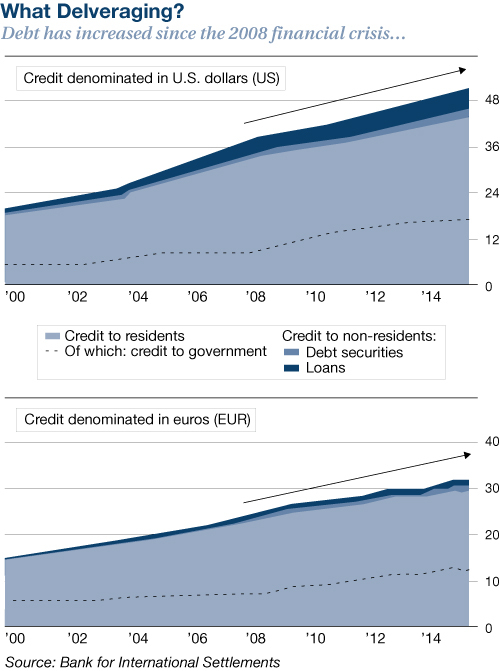 Much of the money borrowed on sovereign debt markets since 2008 has been wasted. The U.S. used most of its $800 billion “stimulus” plan in 2009 to subsidize government and union salaries. China used trillions of dollars in bank debt to build “ghost cities” that will never be occupied. This chart shows the increase in total non-bank debt outstanding in dollars and euros since 2000. The arrows indicate the increase since the global financial crisis in 2008. The black dotted line shows the portion of the total debt borrowed by governments. The chart does not include inter-bank lending and derivatives. The amounts in euros are converted to U.S. dollars using the exchange rate on September 30, 2015. There are three ways to repay sovereign debt: default, growth and inflation. Obviously, growth is the best way, but it’s not happening. The U.S. has been stuck with sub-2% growth for the past 10 years. Europe and Japan are even worse. China’s growth has been higher, but much of that is smoke and mirrors because of wasted investment. Default is another way out of debt. That’s the usual path chosen by developing economies such as Argentina and now Venezuela. But for economies that can print money, default is unnecessary. The U.S. can print dollars, the ECB can print euros and the Bank of Japan can print yen. China has a problem because much of its debt is in dollars, which it cannot print. But China has a $3.3 trillion war chest of dollar reserves it can use. Now that the Chinese yuan is a “reserve currency” (designated by the IMF in late 2015), it’s possible for the People’s Bank of China and the U.S. Federal Reserve to do “currency swaps” where the Fed gives China dollars in exchange for yuan. (These swaps are arranged behind the scenes and kept secret in order not to spook markets.) These swaps can also help China deal with its dollar-denominated debt. Of course, all of this money printing eventually leads to inflation. That’s the third way out of the debt — just inflate the currency. You still pay the debt in nominal terms, but the money’s not worth as much. That’s a good deal for the debtors (like the U.S., China, Japan and Europe) and a bad deal for the creditors (which could be you). Ed. Note: Check out below an incredible visual of the U.S. National Debt. Brought to you by Jeff Desjardins at Visual Capitalist. Source: Visual Capitalist via Jeff Desjardins. P.S. Sign up for your FREE subscription to The Daily Reckoning, and you’ll receive regular insights for specific profit opportunities. By taking advantage now, you’re ensuring that you’ll be financially secure for the future. Best to start right away – it’s FREE.